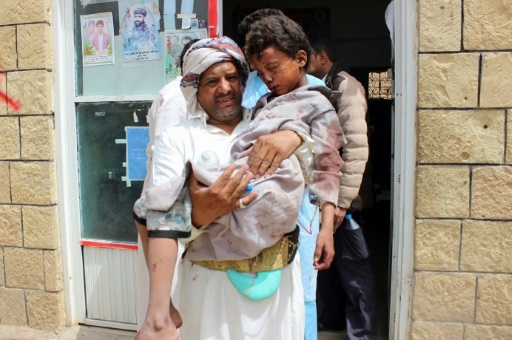 Sanaa (AFP) – An attack on a bus at a market in rebel-held northern Yemen killed at least 29 children Thursday, the Red Cross said, as the Saudi-led coalition faced a growing outcry over the strike. The coalition said it had carried out a “legitimate military action”, targeting a bus in response to a deadly missile attack on Saudi Arabia on Wednesday by Huthi rebels. Coalition spokesman Turki al-Maliki told AFP that claims by aid organisations that children were inside the bus were “misleading”, adding that the bus carried “Huthi combatants”. “A hospital supported by our team in Yemen received the bodies of 29 children under the age of 15 and 48 wounded, including 30 children,” the ICRC said on Twitter. The Huthis’ Al-Masirah TV, quoting the rebel health ministry, reported that 50 people were killed and 77 wounded, “mostly children”, though it was not possible to verify that toll. The Save the Children charity, quoting its staff, said that at the time of the attack the children were on a bus heading back to school “from a picnic when the driver stopped to get a drink”. “Save the Children condemns this horrific attack and is calling for a full, immediate and independent investigation into this and other recent attacks on civilians and civilian infrastructure,” it said. “We call on the parties to take appropriate measures to protect civilians,” Nauert said. AFP / AFP. 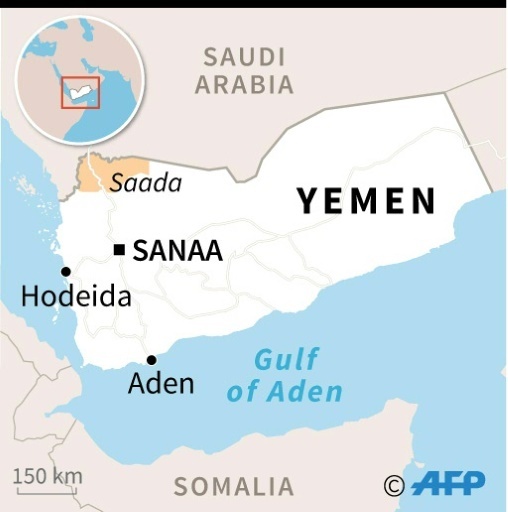 Map of Yemen locating Saada province, where an attack on a bus killed at least 29 children. Geert Cappelaere, the UN Children’s Fund regional director in the Middle East and North Africa, said the children were “reportedly under the age of 15”. “Does the world really need more innocent children’s lives to stop the cruel war on children in Yemen?”. Doctors Without Borders (MSF) said “civilians continue to pay the highest price after three years of war in Yemen, thousands of them have been killed, injured or maimed”. Footage provided by the rebels’ Ansarullah Media Centre showed a number of wounded children lying two to a hospital bed, while in a separate shot medics tended to casualties in a crowded room. Coalition spokesman Maliki confirmed the strike had hit a bus, telling AFP “the elements inside the bus were Huthi combatants”. He said the rebels have “ballistic missiles threatening our national security, Saudi cities and villages on the border. The attack today was a follow-up process to neutralise that threat”. Earlier, Maliki accused the Huthis of “recruiting child soldiers, throwing them in battlefields and using them as tools”. AFP / STRINGER. A man transports a child to a hospital after he was wounded in a reported air strike in Saada on August 9, 2018. Wednesday’s attack brings the tally to 167 rebel missiles launched since 2015, according to the coalition, which that year joined the Yemeni government’s fight against Huthi rebels. Aid agency CARE International noted that Thursday’s strike came a week after the Hodeida bombardment. “This latest air strike, only a week after the attacks on Hodeida city, demonstrates a continued disregard for human life and suffering,” said Johan Mooij, the agency’s country director in Yemen. The United Nations envoy to Yemen, Martin Griffiths, last week told the Security Council “a political solution” to end the Yemen war was “available” and that the warring sides would be invited to talks on September 6 in Geneva. Featured Photo: AFP / STRINGER. 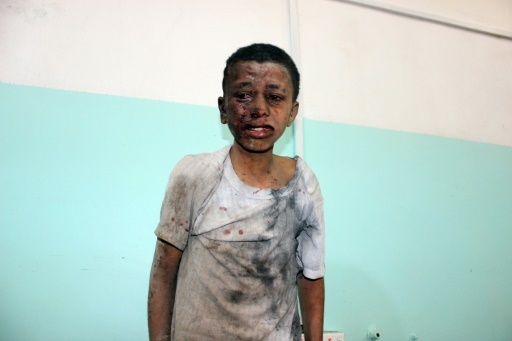 A Yemeni child awaits treatment at a hospital after he was wounded in a reported air strike on the rebel stronghold of Saada on August 9, 2018.